Miss Merivale, Barton Place, no. 162. Oppé suggested that the present view may have been of Rydal Water, a few miles north of Ambleside. Francis Towne visited the Lake District in the summer of 1786 in the company of his friends John Merivale and James White. They met in Manchester and reached Ambleside by 7 August where they were based for most of their stay, leaving the Lake District on 23 August. 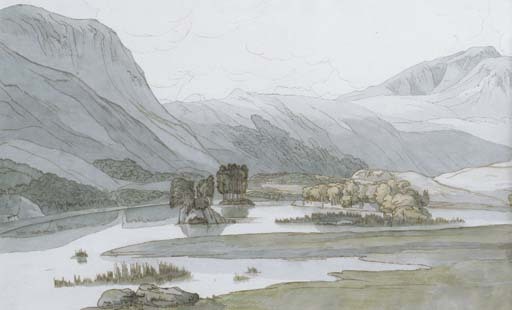 A view of Rydal Waters was exhibited at the Tate in 1997 and is illustrated in T. Wilcox, Francis Towne, 1997, p. 47, illustrated in colour p. 49 (6 1/8 x 9¼ in., pen and ink and watercolour, signed, inscribed and dated 'Taken at the going off of a storm/No 8/Rydal Water with Mr Jones's and Sir Michael Fleming ..1786 ...', Victoria & Albert Museum). Towne exhibited three views of Rydal Water in 1805. Another was sold at Christie's, London, (14 August 1942, 11 x 22¼ in.). We are grateful to Dr. Robert Wooff of the Wordsworth Museum for confirming that this is a view of the Rydal Valley in the Lake District with Loughrigg on the left and Silverhow on the right.